Although donuts are one of my favorite desserts, I rarely make them because of their time-consuming nature. 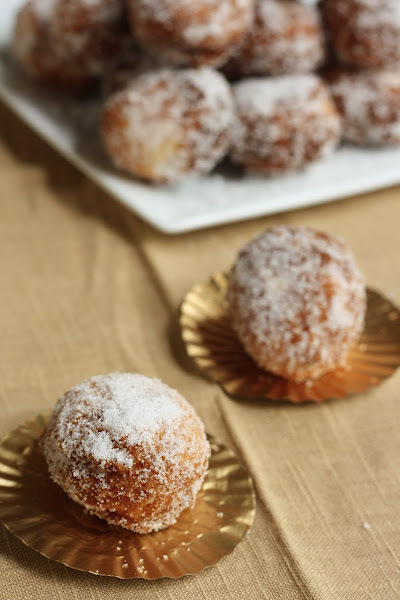 Not only are donuts are made from a yeasted dough that requires a few hours to rise, I also find the deep-frying process and post-frying clean-up to be a hassle. As a result, you can see in my Recipe Index that the Donuts & Pastries section is a little lacking. This recipe is kind of a hack -- after looking at the recipe, I realized it was actually a quick bread recipe. Quick breads are distinguishable from regular breads because they don't use yeast and are made from a light batter instead of a heavy dough. The donut holes also had a strong buttermilk flavor, reminding me of the cake donuts you can get at supermarkets. When served fresh, these donuts are the very definition of heaven. They're best consumed right after you've rolled them in sugar, since the warm donuts almost caramelize the sugar and melt in your mouth. Unfortunately, as a general rule, quick breads don't keep as well as yeasted breads, so it's best to eat these donuts the day that they're made. In a small bowl, whisk together 1 1/4 cups flour, 2 teaspoons baking powder, and 1/4 teaspoon salt. Set aside. In a medium mixing bowl, whisk together 1/4 cup milk, 1/4 cup buttermilk, 1/4 cup sugar and 3 tablespoons melted butter until just combined. Use a sharp knife to split the vanilla pod open lengthwise and scrape seeds into the milk/sugar/butter mixture. Whisk until vanilla beans are thoroughly incorporated into the mixture. Combine the small bowl of dry ingredients with the medium bowl of wet ingredients, using a rubber spatula to stir in the dry ingredients and mixing until just combined. 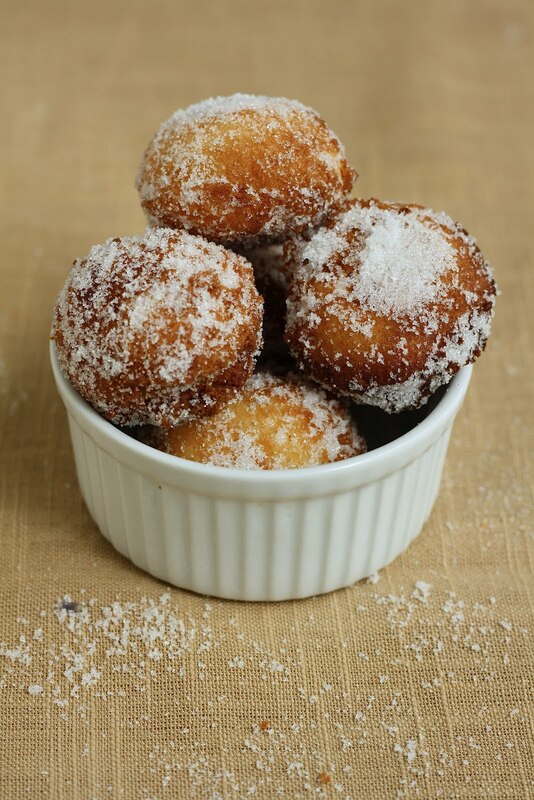 Be careful not to overmix, or you will get dense donut holes and I will cry for you. The texture of the dough should be sticky. Preheat 2 cups of oil over medium heat in a 10 inch pan (I used an iron skillet). Drop the dough into the pan of oil. Fry until golden brown on bottom then flip and cook on the reverse side until golden brown. 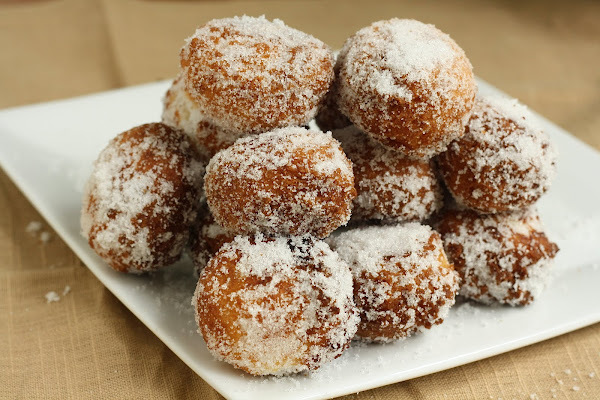 When the donut hole is finished frying, carefully remove with metal tongs or a fork and place on a cooling rack lined with paper towels to absorb the excess oil. 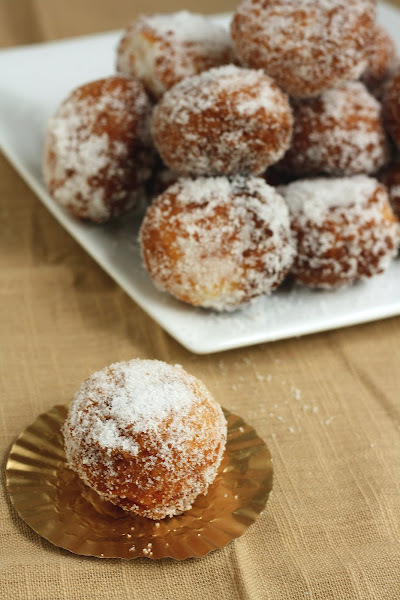 When the donut hole has cooled down enough so that it doesn't burn you when you pick it up, roll in a small bowl filled with 1/2 cup sugar. Set aside. Repeat this proces with remaining dough. 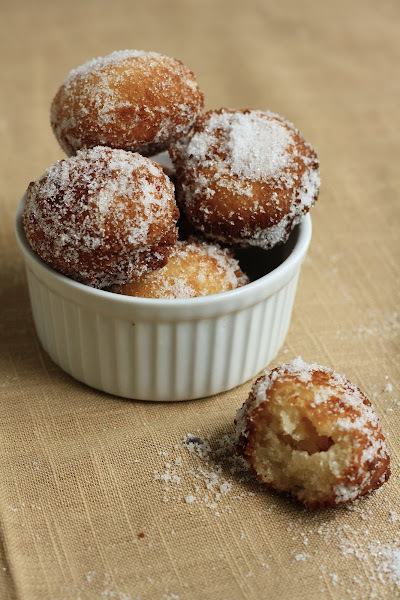 You can cook more than one donut hole at a time. I was able to cook six in one go. I do love fresh donuts, these sound worth the effort. Thanks for sharing! Oh, these look amazing. You've got my mouth watering with your description, too! I'll have to keep these in mind next time I'm craving donuts! Hi there, I think to make a 1/4 cup of buttermilk, you need 1/4 cup mile and 2 3/4 teaspoons vinegar or lemon juice. Let the milk sit and curdle for 10 minutes before using. You can also use canned coconut milk, but it will have a more coconutty flavor. Also, yay for being from the Philippines! My mom is Filipina. Try looking at Shopwise if there's one near you. I know they sometimes have US dairy products like yogurt and milk in their cold section. Oh my goodness, In Canada we have these little doughnut holes called "timbits". They are delicious and this recipe makes me want to make these ASAP! Thanks for sharing! I'm making these for a bachelorette BBQ (the bride-to-be is OBSESSED with donuts). Little problem though: can't find a vanilla pod! Can I sub vanilla extract, and if so how much? Thanks!! This is perfect for National Donut Day!